See scan - perfect condition. Good margins and comes framed with wooden frame and photo reflective glass. This is a scarce and very rare 1612 Raffaello Schiaminossi AND Luca Ciamberlano etched gravure print of MADONNA / MAGDALENA AND HER TRAVEL IN HEAVEN. This work of art is signed and dated and comes out really rare. It is thought that Schiaminozzi studied with Rafaellino dal Colle or Santi di Tito. 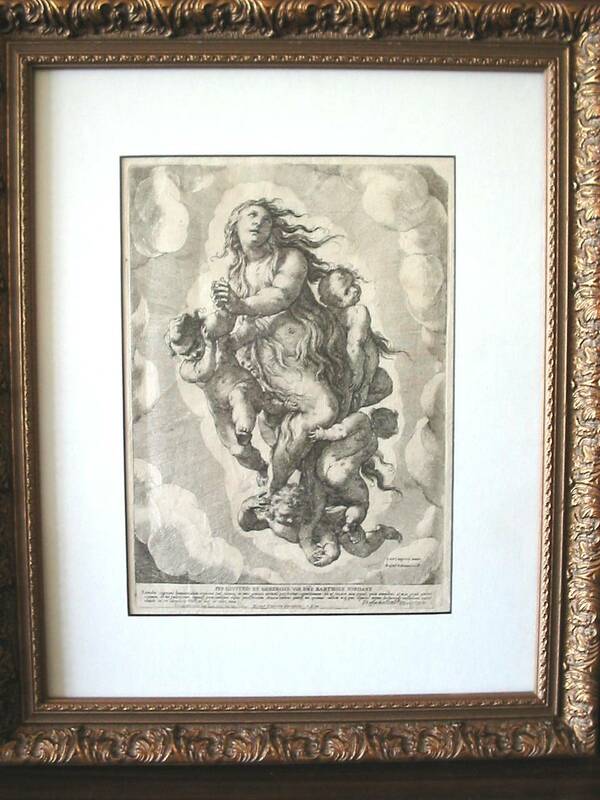 Works of art and other drawings by Schiaminossi are quite rare. Less than a dozen are known and most of these were only very recently published in the first monographic exhibition and catalogue on this Tuscan artist. 1 Of these only one drawing is a chalk study; 2 the rest are pen & ink & wash compositional sheets, probably preliminary sketches for fresco projects. Very little of the artist's painted oeuvre is known. Most of what remains and is identified are his engravings of which over 150 plates are known. These date from 1595 until 1620. Most famous were those etched after Jacopo Ligozzi's extraordinary landscape drawings of La Verna for one of the most unusual books of the 17th century. It depicts the mountain retreat of St. Francis of Assisi. Shiaminossi's etching technique was "bold, featuring dense areas of dark hatching contrasted with lightly etched areas. Scarce collector piece.